@IceCream Don't use mobile for complex processes. That just seems kinda like common sense to me. @IceCream MS Paint allows for easy palette modification across the whole sheet. @WizToad: I agree. However, that's actually a leftover sprite from Sonic Mania, where it appears with the Blueprint Zone objects (S1, S2, and S3&K sprites). I might make a fixed version later. 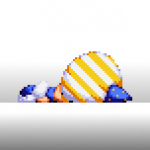 Not gonna lie, that Casino Night icon has some really weird and uneven quills on Sonic. Everything else on the sheet looks pretty cool though. @TTH888: Sweet! Can't wait to see this sheet put to good use! Also, you are more than welcome to revise this sheet if you'd like to add or edit poses. Looks like it finally got through! Also, Pavel, you are not allowed to use this in any way, shape or form. I've had it with you. Anybody else, feel free to use it. Just credit me and Thomas.